← Bragging on my nephew and brother-in-law! Time for a new post and an update! It has been awhile since I have given and update and a lot has happened so here goes. I spent time in Kansas and Oklahoma over the Christmas break with family, friends and got in a nap or two. I played for a New Years Eve dance/party at St. Bernard’s in Tulsa with John the Blessed – the band I also play with for other gigs when I am in town. For the J-term at St. Meinrad I spent 3 weeks at the Mexican American Cultural Center (MACC) in San Antonio in January. This was a mini-pastoral experience to learn about multiculturalism and how to better do ministry in our ever changing USA. This was quite an eye-opening time with a trip into some of the poorest parts of our country and across the border into Mexico. I will be adding a couple of posts later on this subject, so will not go into details here. I am back in school and am really looking forward to the new semester. My classes include Christology, Intro to Homiletics, The Sacrament of Marriage, and Christian Morality and the Pursuit of Holiness. As usual there is a lot of good reading and the teachers are all excellent. I am also working at the Vibrary (an in-house video rental library), and I will continue to play in Abbey Mode – the house band for the Unstable. My ministry also continues this semester at the Guadalupe Center teaching first communion class, a quinceanera class (a special celebration for 15 year-old Latino/Hispanic girls), and leading the music at a Spanish Mass on Sundays in Dale, IN. My time in Guadalajara last summer and at MACC have really helped me understand the culture and background of the Latino/Hispanic community, and has opened my eyes to some of their needs and how we might work together for a better US. I was be installed as an Acolyte in the Catholic Church today. This is another step on the road to priesthood. I will be able to assist the priests and deacons at the altar during Mass in an official capacity. I can also be an extraordinary minister of Holy Communion in any Catholic Church in the world. Each step is so fulfilling as I continue to walk in God’s will for my life. 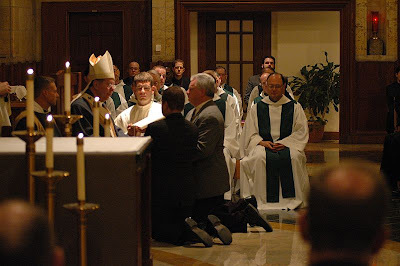 The picture below is of me and my classmate Gary Mayer kneeling in front of the Archbishop of Indianapolis who presided at the ceremony/Mass. I also started a MySpace account. You can visit it at http://www.myspace.com/johntheblessed. There is not much on it yet, and this will be my main blog for posting, but now I have a MySpace presence also. That’s about all for now. Thanks for keeping myself and all seminarians in your prayers, and also for praying for vocations to the priesthood or the religious life – both for young men and women. Your prayers are appreciated by me, all those serving the Lord in their vocations, and by the Church through which we all serve one another and the Lord. This entry was posted in Family Friends and Life, Ministry and Church, School. Bookmark the permalink. Hi John! Keep up the wonderful work!! Thanks for encouraging my bride on her ministry as emcee of the twoedgetalk podcast. It meant a lot to her, and to me as well. John O’Neil! Gosh, so glad you posted on my blog so I could catch up with you on your blog! What a rich and full life you have, and I’m certainly not surprised. You’ve always been “in the world, but not of the world”. Please send our little podcast to your seminarian friends, and ask them to send it on, too! Deacon Tim has so much to say, and we’ll be posting a new interview each week. Peace be with you!